The formations can be viewed at any beach but Whiting’s Lakefront at Whihala Beach, West Beach or Lake View in Beverly Shores are some favorites. The Michigan City Lighthouse and Pier also offers a breathtaking view when frozen and offers great photography if you can brave the chilly air. Be warned, shelf ice is not stable and extremely dangerous. Be advised – NEVER walk on shelf ice. 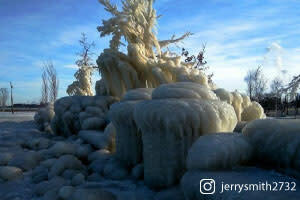 If you&apos;re lucky, you might see other winter phenomenon while visiting the lakefront. 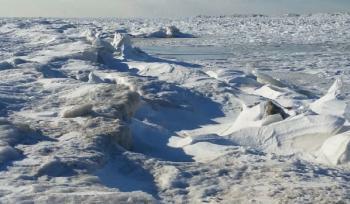 A winter storm and high winds created an ice world at Whiting&apos;s lakefront recently as seen in the photo below. As part of a multi-agency study of bison genetics, an additional 10 bison have been added to the herd at The Nature Conservancy’s Kankakee Sands. At one time, more than 50 million bison roamed North America but by the year 1889 the population dwindled to less than 1,000. A herd of bison were added to the Restoration Area at Kankakee Sands in Morocco to help invigorate the nature prairie landscapes by eating grasses to increase plant diversity. 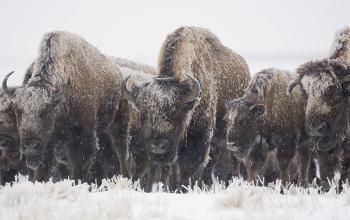 There is a viewing area available to visitors to watch the bison and their calves in their natural state. More than 25,000 acres of land provide additional opportunities for wildlife and bird watching. 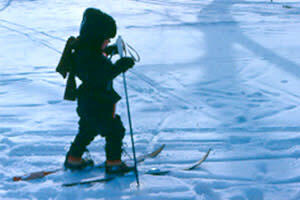 The Indiana Dunes State Park is home to Devil’s Slide, a fantastically fun spot to enjoy the snow with your family. Bring a thermos of hot cocoa and enjoy an afternoon hiking or snowshoeing along the trails at the State and National Parks. Deep River Waterpark transforms from "splashtastic" in the summer to frozen and fun in the winter. Families can skate the plaza through February 25. 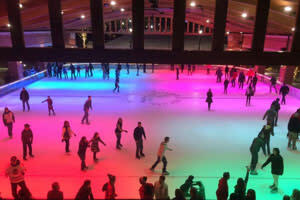 Open skating is available Thursdays through Sundays and rentals are available onsite. Concessions and lockers are available as well. Bring in two cans of non-perishable food items and receive half price admission on Sundays and Thursdays veterans and active duty military receive free admission.